The other night as sleep eluded me, I requested my husband to tell me a story. Though juvenile, the exercise was definitely enjoyable. He started narrating a tale in which the protagonist was a small car. The story took me through this little car’s journey into the big, bad, puzzling world–about its getting lost in the woods, feeling lonely and scared, and finally being brought back to its mother, a truck. A story suitable for all children, including the occasional one like myself. It was a rather well-crafted story with all components fitting well with each other and flowing logically. At the end of it, I wondered where did he, who insisted on being a reader, not a writer, get the brainwave for this story? And that brought me to the bigger question–where do well all get our ideas from? From life around us, some would say. Of course, that’s true, but what plants a particular story seed in one’s brain in the first place? The answer remains one big mystery and has been so for quite a while since humans embarked upon adventures in creative expression. These words are the ones uttered by the archangel. I like to think the mystery of creative spark is what endows it with so much excitement. When you start off, it’s not a known path you take, it’s not a less-known one either; it simply is one that unfolds in real-time, moment by moment. And nothing brought home this aspect of creativity to me more than a film I watched recently. Séraphine, a 2008 film, tells the story of a self-taught French painter, Séraphine Louis or Séraphine de Senlis (Séraphine of Senlis) who was born in the late 19th century, and died in 1942. When I read the film’s synopsis, I took it to be fictional. For it is hard to believe the extraordinary life of this artist and the events that punctuated it. Orphaned by the age of seven, Séraphine grew up to a life deficient in comforts of the material kind, but rich in imagination and nature’s marvels. After spending years working as a shepherdess and a maid, she got hired as a servant by the nuns of a convent when she was eighteen. Pious and hardworking, she spent two decades with the convent, before returning to her role of a maid to keep her stomach palette filled. 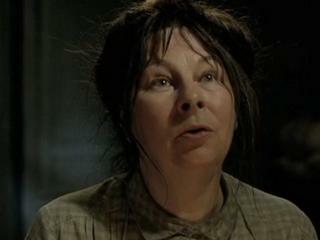 This is the role–of an ageing maid–that the film Séraphine opens with. We see a zaftig and somewhat eccentric spinster in the houses of aristocrats in the French town of Sinlis. She is like any other maid one might have come across at that time–earnest, diligent, careful with her money. Except, she is not any other maid of her time. Yes, she is earnest in her chores of floor-mopping, cloth-washing, dish-cleaning, but her real sincerity lies elsewhere. She is most diligent in answering the commands of her masters and mistresses; but it’s nothing compared to the command she truly cares for. And the prudence she shows with expending her meagre earnings is not to indulge herself, except for her life’s passion. Early on, along with portraying the rigours of her job as a maid, the film establishes her love of nature. Next, it is revealed that the pennies she so painstakingly earns and haggles for with her employers are not for buying bread, but art materials–paints and brushes–from a local store. She is even shown to sneak oil from church lamps, except her god knows this is no pilferage. 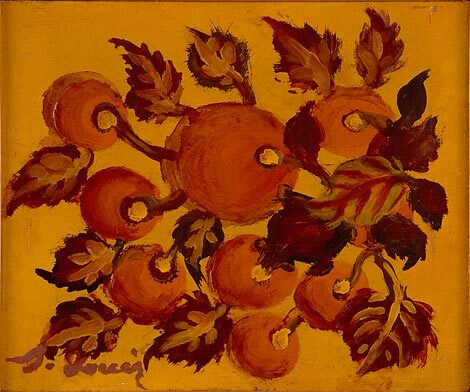 For, in the course of the film we learn that Séraphine‘s foray into the world of painting was prompted by a command she received from her guardian angel. We see her painting furiously, squatting on the floor of her cramped, untidy room, even as she fails to pay rent. 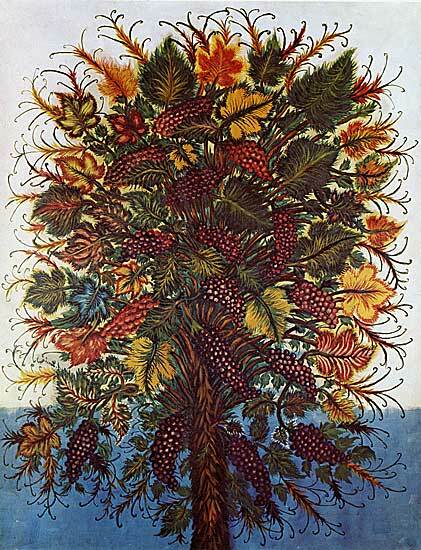 Her subjects are typically drawn from the natural world–trees and birds she would claim to “talk to”, fruits and vegetables, animals and the sky. It’s not long before the film as well as Seraphine’s life story take a decisive turn–with the entry of Wilhelm Uhde, a German art collector. He rents an apartment in Senlis, where Séraphine does cleaning work. By sheer chance, he comes across one of her paintings at a dinner invitation. Struck by the creative vitality, Uhde immediately takes her under his wings. Even as his encouragement bolsters the artist inside Séraphine, the scimitar of World War I slashes their association–the art collector has to flee Senlis as his house is raided. Thirteen years later he returns to France and, once again, is faced with Séraphine–through a painting of hers he sees at an exhibition of local artists’ works. 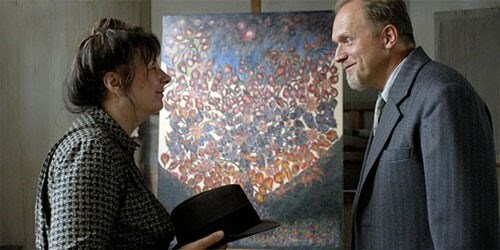 One of the most touching parts of the film is when Uhde traces his steps to Seraphine’s creaky room and assures her of supporting her painting career–by this time, the old maid is even older, and weighed down by age and its annoyances, she cuts down on her house assignments, focusing instead on her heart’s calling–painting. Soon, thanks to the provision of art materials and a monthly allowance, set up by Uhde, the self-taught artist begins painting with an intensity greater than before. We see her causing an explosion of colours on huge canvases, even as her lifestyle too improves. This burst of creativity wouldn’t last too long either. This time, her own mind would be at war with Séraphine. Hallucinated and “hearing voices,” she scares her neighbours and is finally taken to a mental asylum. Almost immediately, she gives up painting. Forever. Three years after her death, Uhde would organize an exhibition devoted entirely to Séraphine‘s works in Paris. Ironically, during the last phase of her painting life, this is what Séraphine desperately wished for–a solo exhibition. As exceptional as Séraphine Louis’s life story is, the film achieves in conveying it with outstanding maturity. The strongest element in this is Yolande Moreau, who is Séraphine in the film. She appears so natural–both physically and in her mannerisms–that it’s hard to believe she is acting in a film and not living her actual life. However, what makes the film all the more powerful is the deftness with which the director, Martin Provost, has turned almost every frame into what could be a painted canvas or a brilliant photograph–works of art. Whether it be the fields or streams Séraphine passes through or the night when the terror of war booms through Senlis streets with cannon shots or Séraphine’s imaginations bursting forth on to a canvas–the scenes are rich with eloquent detail. Yet, none of it is loud that would scream for attention. Even as Séraphine‘s story intrigues me, it brings me back to the exciting mystery that spawns creativity, while also stuffing me with bagfuls of inspiration. Do watch this film if you can. You won’t regret it. A very thoughtful piece. I will queue up this one on my netflix. In the end, whatever it is that makes us create is for sure fiercely painful, as painful as it is exhilarating. Sounds fascinating, Bhaswati. Thanks for the heads-up.I don't know if I agree that artists tap into some wellspring of creativity that exists outside themselves. Then again, I'm no artist, so what the heck do I know? :)Thoughtful, well-written piece, Bhaswati. It's nice to see your words again.